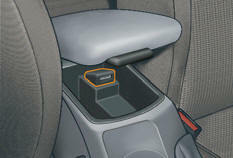 This connection box, consisting of a USB port, is located in the front armrest. It permits the connection of portable equipment, such as an iPod ® digital audio player of generation 5 or later or a USB stick. For more information on the use of this equipment, refer to the "Audio and Telematics" section.